From its discovery, the fact that hydrogen is the lightest element made it seemingly a perfect candidate for early air travel. The first hydrogen ballloon was launched on 27 August 1783 from the Champ de Mars in France which is now the site of the Eiffel tower. It took almost a quarter of a tonne of sulphuric acid, poured onto half a tonne of iron to produce enough hydroden to fill the 35 cubic meter baloon. This had to be done over a number of days to fill it though lead pipes, due to the fact that the gas was hot when initially produced, but when it entered the balloon it cooled down and contracted in volume. Eventually the rubberised silk ballon was filled with enough hydrogen to lift around 20 pounds (9 kilograms) of weight. As it travelled across the French countryside it was pursued by men on horseback to track its progress. 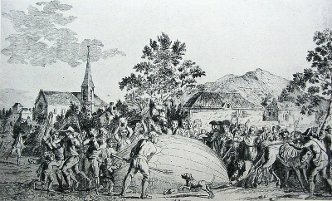 After 45 minutes and 13 miles of north-easterly travel, the balloon landed in the villange of Gonesse, terrifying French peasants as it landed. Fearful of this monstrous creature that had come out of the sky, the villagers attacked it with knives and pitchforks - an unfortunate end for a historical marvel of science! Fortunately the first manned flight in a hydrogen balloon did not meet with such a violent end. This was made by French inventor, Jacques Charles and his co-pilot, Nicolas-Louis Robert in on 1st December 1783, only 10 days after the world's first manned free-flight in a hot-air balloon flight had been made. 400,000 spectators avidly watched the 380-cubic-metre balloon start its 2 hour and 5 minute journey, during which the balloon travelled 22 miles and reached a height of around 1800 feet (550 metres). . Horse riders who had been chasing after the balloon held it down as it landed at sundown, and the two balloonists jumped out of the basket which had been carrying them. Charles then decided to have another go, this time flying alone due to the fact that some of the the ballon was no longer completely filled with hydrogen. This time he rose rapidly, quickly reaching an altitide of 9,850 feet(3,000 metres), at which point his ears began to hurt. Releasing gas from a valve he managed to land in a controlled fashion just under two miles away from his take-off pont. Charles reported that although it had been past sundown he had been able to see the sun at the altitude he had risen too, but he never flew in a baloon again. The following year, 1784, saw the first in-flight propulsion when another French national, Jean-Pierre Blanchard used a hand-powered propeller to help direct a hydrogen balloon's path of travel. Then in 1785, Blanchard and the American Dr, John Jeffries became the first humans to travel across the English Channel by balloon, using his system of flapping wings and a windmill, with a bird- like tail to help guide the baloon in the right direction. The flight was successfully completed in around 2 and a half hours. 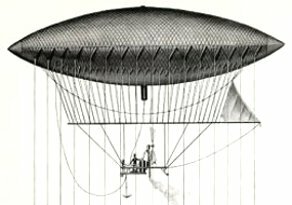 Quite a few years passed by before the creation of the first hydrogen balloon to be powered and fully steerable in a controlled way in 1852. Known as a Dirigible, it was steered by a steam-driven propellor. It also included a vertical rudder. Its first flight on a 17 mile journey from Paris to Trappes was plagued by strong winds, which meant tht the return journey could not be made. However, its inventor, Henri Giffard was still able to make controlled turns and circles during the flight. Over subsequent years the design of hydrogen balloons gradually improved, until in 1900 the famous Zeppelin took its maiden voyage in the skies, following an initial test flight of the world's first rigid-hulled airship, made by Hungarian inventor, David Schwarz, in 1897. Inside their rigid almininium-hull, a number of separate balloons, known as "gasbags" or "cells", filled with hydrogen kept the Zeppelins in the air. Helium was normally used in the USA, being safer as it is non-flammable. However, helium is rarer and more expensive than hydrogen. It is also heavier which means that a Zeppelin with helium gasbags would not be able to carry as much payload compared to if its gasbags were filled with hydrogen. Named after the German company which made them, the Zeppelins began their first international scheduled passenger flights in 1912. After being used in bombing raids and reconaissance during the First World War,the whole of Germany's Zepplin fleet was signed over to the allies as part of the reparations. An English company, Beardmore, had been observing the technical progress of the German Zeppelins, and in 1919 the Briish-built Beardmore HMA R34 made the first Atlantic crossing by airship. These flying wonders also helped in the history of arctic exploration. On 12 May 1926 the first ever flight over the north Pole was made by Umberto Nobile and a 16-man team including Roald Amundsen, in a hydrogen airship called the Norge. By the 1930s, airship travel has become hghly popular, with regular transatlatic flights operating to America and Brazil. Even the Empire State building was created with airships in mind. Completed in 1931, the building's characteristic art-deco spire was designed to be a mooring mast and airshiip station. Check-in was on the 86th floor observation deck, and an elevator was designed to travel from that floor up to the 102nd floor to embark and disembark via a gangplank to the moored airship. Unfortunately not much planning seems to have been undertaken for this admirable idea, After the Empire State building opened one aiship did try to dock there. A rope was thrown from the airship and, after about half an hour was finally caught by three men, Unfortunately after all of this the airship was only able to remain docked for three minutes. It was determined that updraughts from the building and the dangers of using just a single rope to tether an airship were too risky over a highly populated city, and the airship docking idea was abandoned for the building. Popularity of airships continued to soar as high as the ships themselves could fly, but a sudden dreadful event brought a sharp halt to everything. On 6th May 1937, whist in the process of docking at Lakehurst Naval Air station in New Jersey following a two-and-a-half day flight from Frankfurt in Germany, the Hindenberg suddenly burst into flames, crashing to the ground whilst on fire, and killing 13 of the 36 passengers, 35 of the 61 crew and one of the ground crew. 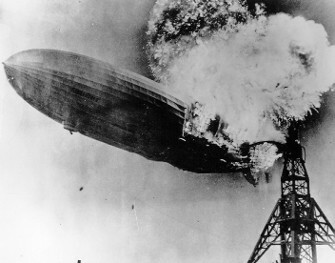 Numerous theories have been postuated on how the hydrogen in the Hindenbrg caught alight, including the possibility of lightning having hit the airship, but the actual cause remains unproven and therefore uncertain . Covered on live radio and recorded on newsreel, the disaster caused mass loss of confidence in hydrogen airships, and led to the end of airship passenger travel. Today, some people say there may still be hopes for airships as a future method of transport, although whether these will be hydrogen or helium is something only the future will tell. It is argued that with modern technologies and materials, the safety and risks of hydrogen airships could be minimised to acceptable levels. Indeed, in the science fiction series, Fringe, airships are being used in the alternative universe. OK, Fringe is science fiction, but so was Jules Verne's Mysterious Island in 1874 when he predicted that the hydrogen from water would one day be used as fuel!